If I ever get the US Ryder Cup captaincy will you come on board as an assistant captain and bite the head of a live European? 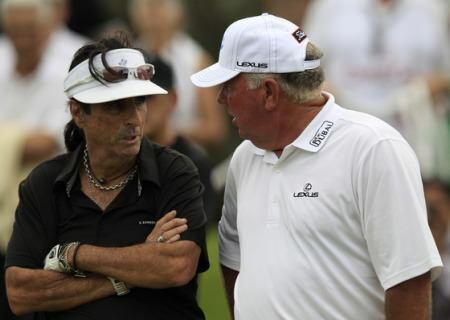 - Mark O’Meara chats with veteran rocker Alive Cooper during the Omega Dubai Desert Classic Golf Challenge at the Jebel Ali Golf Resort. Photo Eoin Clarke/www.golffile.ieFollowing Lee Westwood’s declarations of support for new Ryder Cup captain Paul McGinley, Irish interest in the Omega Dubai Desert Classic moves to Shane Lowry’s world ranking. The Carton House touring professional appeared to be on the brink of breaking into the world’s Top-50 and securing his Masters debut late last year when he won the Portugal Masters and headed for the DP World Tour Championship as the world’s 57th best player. However, he ended up spending the week in a Dubai hospital instead after being struck down by a virus. 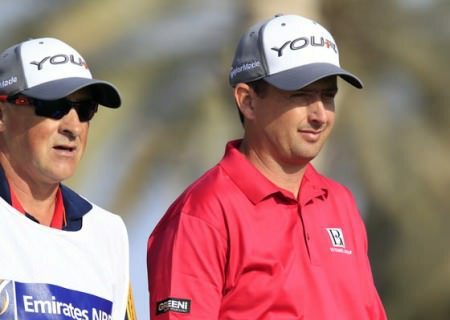 Not to worry, it would all be sorted early in the New Year and a place in the Top-64 who will contest the WGC-Accenture Match Play in Arizona next month was surely nothing more than a formality. Fast forward nine weeks and Lowry is 62nd in the world and facing a testing week in the desert, where he cannot afford to miss the cut if he wants to be absolutely sure of his place in Tucson. While he finished 10th on his 2013 debut in the Volvo Golf Champions in Durban, a missed cut in Abu Dhabi has left him vulnerable. At the time of writing he has not entered next week’s Joburg Open, which is the final counting event for qualification for the Match Play. Of course, Lowry’s real goal is to be inside the Top-50 at the end of March so he secures that priceless invitation to Augusta National. And while he is hopeful of invitations to tee it up in some US Tour events thanks to his relationship with stablemate Rory McIlroy, making the field at Dove Mountain would ease his path to the Masters. 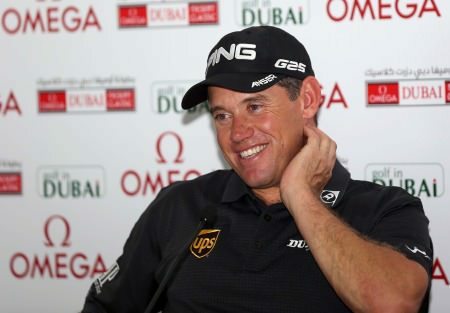 A relaxed Lee Westwood speaks to reporters in Dubai on Tuesday. Picture by Getty Images.A good performance in Dubai is a must and the precedents do not help take the pressure off the Offaly man, who missed the cut on his debut in 2010, missed the event altogether in 2011 after fracturing his wrist and then faded to 66th after opening with a 68 last year. As for newly-minted McGinley supporter Westwood - his first choice was best friend Darren Clarke - the Englishman believes he can hit the ground running when he makes his first appearance of 2013 this week. The 39-year old has an enviable record at the Emirates Golf Club, taking the runner-up spot three times, in 1999, 2010 and 2012, and amassing a total of seven top ten finishes, but in 19 appearances he has yet to pick up the trophy. However, having moved to Florida towards the end of last year, Westwood has spent the off-season practising and honing his short game in the sunshine – a welcome change from the snow of Worksop – and believes he is starting this campaign better prepared than any other. “I played a lot more this winter than I would normally play,” said the World No 8. “There’s no rust. The main reason for moving to Florida was to get more games of golf, as I wouldn’t play normally when I’m at home because of the weather. Westwood has come close to victory over the Majlis course on several occasions, and admits he would love to go one better this time. “I should have won when I was up against Miguel (Angel Jiménez) in a play-off in 2010, and then last year I had to birdie the last to force a play-off with Rafa (Cabrera-Bello) and missed it, so I feel like I’ve let a couple slip,” he said. “It’s certainly one I would like to win. I’ve been back here every year apart from one since 1994 and I have a good record. As for his views on Captain McGinley, Westwood was diplomatic about his former stablemate having vociferously backed Clarke in Turkey last year in what was the opening gambit in the Ulsterman’s campaign. What Lowry wouldn’t give for a touch of McGinley’s Irish luck this week. Rory McIlroy drives towards the Dubai skyline on the eighth at the Emirates Golf Club. Photo Eoin Clarke/www.golffile.ieRory McIlroy struggled to a “ragged” 72 but still kept new pacesetter Lee Westwood in his sights on a jam-packed leaderboard the Dubai Desert Classic. 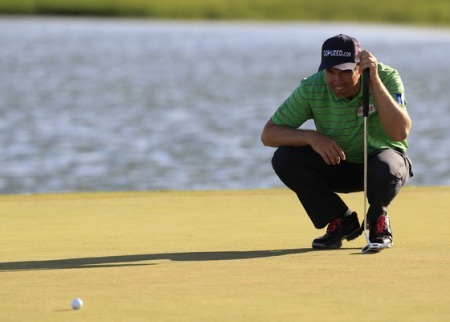 Padraig Harrington lines up his birdie putt on the 17th at Vilamoura. Picture Eoin Clarke/www.golffile.ieIf Paul McGinley is looking for any Ryder Cup captaincy endorsements from the general membership of the European Tour, he can probably count on Simon Thornton. Shane Lowry drives on the eighth in the first round of the Omega Dubai Desert Classic. Picture by Eoin Clarke/www.golffile.iePeter Lawrie opened with a super 66 in the Omega Dubai Desert Classic but Shane Lowry’s 74 left him in danger of failing to qualify for next month’s WGC-Accenture Match Play suffered a major blow.